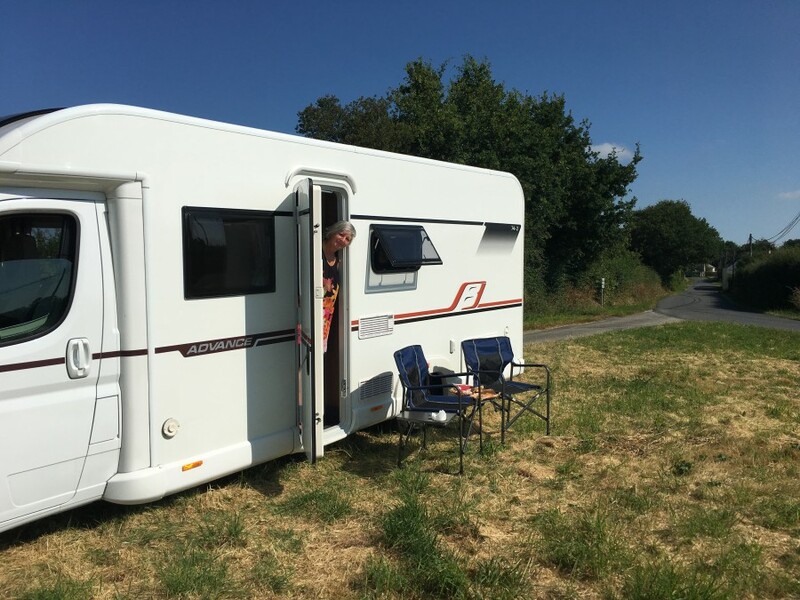 Andy Mossack swaps his usual luxury hotel for a new Bailey Advance 74-2 motorhome as he tours southern Brittany. In my dream, I was tucking into a crusty baguette and my motorhome was driving itself when I swear I heard gentle chimes of music. Then, I opened my eyes and realised I was in my Brittany Ferries cabin on an overnight voyage from Portsmouth. The gentle music signalled I had time for a quick shower before checking out for our imminent arrival in St. Malo. For many people St. Malo is the dropping off point for touring France and beyond, but if you have the time it really is worth a wander around, especially the walled old town. The beaches are pretty impressive too. But we had a few hours of driving through Brittany ahead so this time around, after stopping at a local boulangerie for freshly baked croissants, we set off towards Rennes. Here’s the thing about France. In between towns and cities you rarely find much traffic, but as soon as you draw close to the suburbs it’s a different ball game. After negotiating some traffic on the Rennes périphérique we were on the home stretch finally crossing into the Pays de la Loire region towards La Baule and Saint-Nazaire. The motorhome was performing admirably well and for a newbie like me, I found it a lot less daunting than expected. Sitting up high you get a better sense of the road ahead and, surprisingly for a long vehicle, it manoeuvred around southern Brittany’s back roads pretty comfortably. Our base for the next few days was the charming Le Château du Deffay deep in the Parc Regional de la Grande Briere, a vast area of protected wetlands not unlike Florida’s Everglades but sans alligators. It was also along the route of the fourth stage of the Tour de France and it was a joy to see the locals embracing the event with such gusto. Each roundabout we passed was a study in road art, dressed up with bicycles in creative poses. 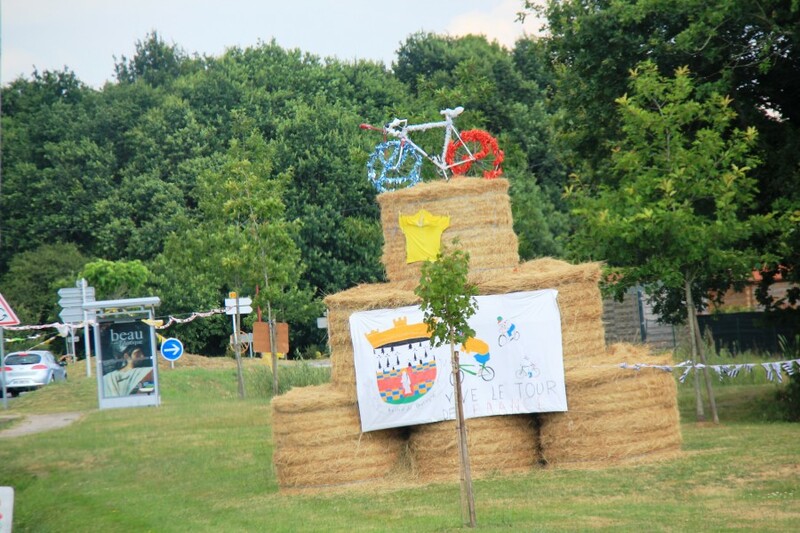 Its eye-opening what you can achieve with old bikes and a few bales of straw. 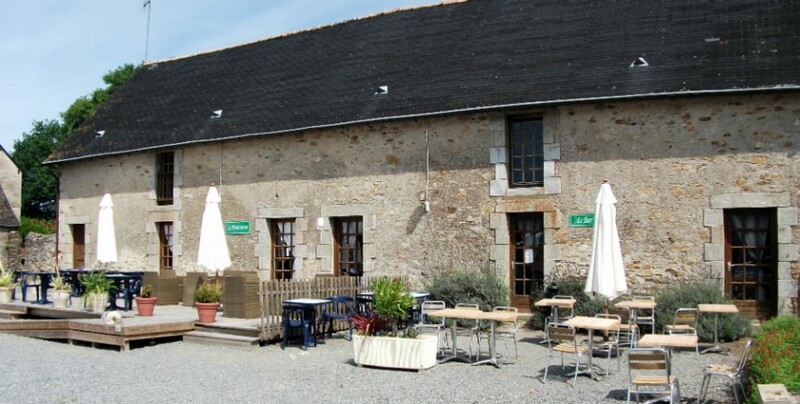 The campsite was on the estate of an ancient chateau, the rustic farming outhouses now home to a small restaurant and bar and swimming pool and in the adjacent field, rows of hedge-lined pitches. Speaking of pitches, seasoned campers just turn up, hook up and set out their stalls. For us though there were many decisions; do we park the motorhome sideways or lengthways, which side do we want the door to face, will the electric cable reach the power outlet, does the water tap provide drinking water. I’m sure our antics provided plenty of entertainment for our seasoned neighbours who looked on in puzzled amusement. Ultimately we were parked and connected (yes it was drinking water) and with our orders in for the next day’s fresh bread delivery, we set off to explore Saint-Nazaire. This was a town packed with surprises. None more so than its history of shipbuilding – expertise that exists today – and its strategic importance to the Germans during WW2. Down by the harbour, where the Loire meets the Atlantic and where great liners once sailed to America, lies the biggest U boat base the Germans ever built. And next door, a shipyard capable of building the biggest ships known to mankind. The vast submarine base, with its U boat pens still virtually intact, is encased in concrete so thick it was bombproof. 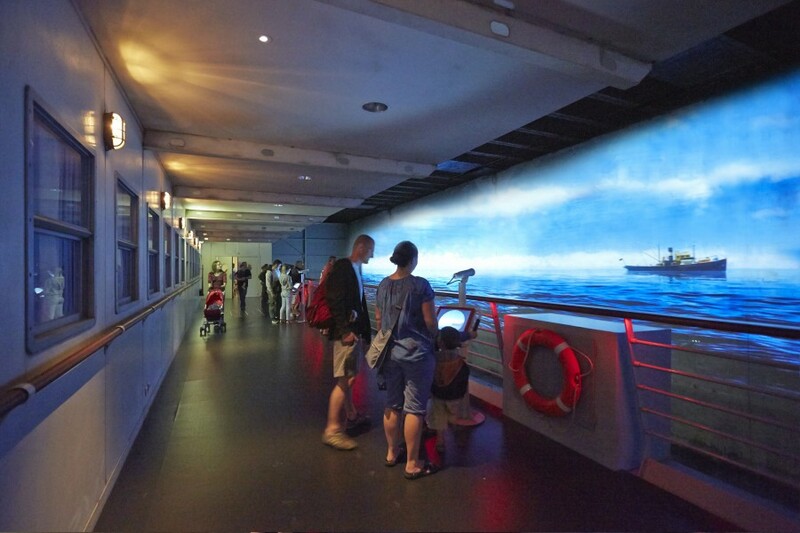 Today the U boat pens provide a much less sinister role, as the backdrop to an extraordinary interactive experience. The Escal’Atlantic recreates the entire interior of an early 20th-century ocean liner. Using many artefacts from those great ships, you can wander the public areas from staterooms to lounges and discover, behind the glamour, the engine rooms or up on the bridge, experiencing what it was really like to be a passenger during the golden age of cruising. It was probably one of the finest tourist attractions I have experienced. 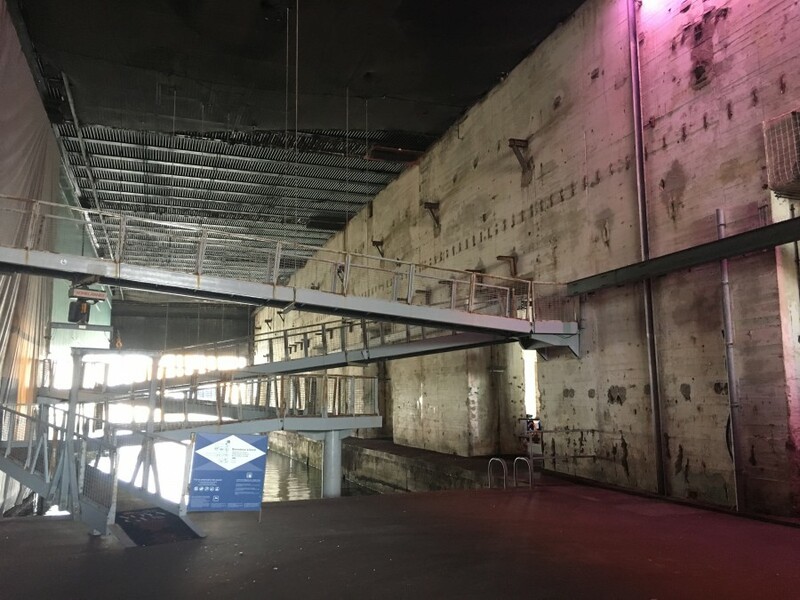 The Chantiers de l’Atlantique shipyard tour is another unmissable experience. 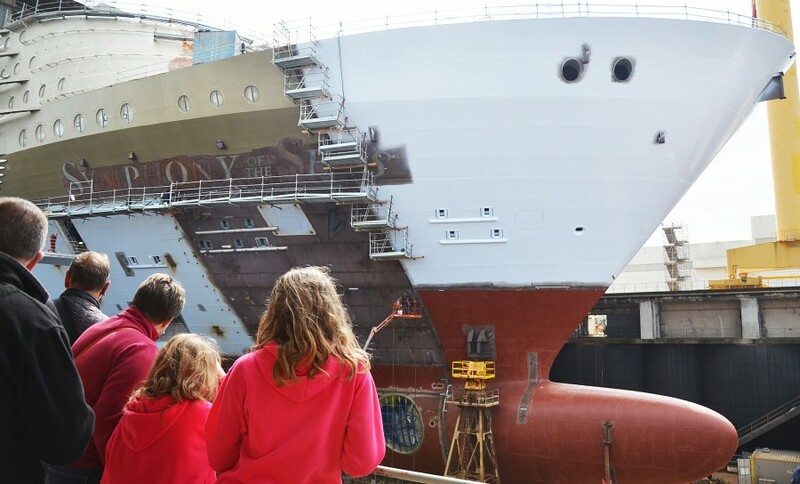 Take a coach tour around the shipyard responsible for building most of the world’s biggest ocean liners including the new Symphony of the Seas in 2018. During our visit, there were four liners all under construction and the sheer magnitude of these giant ships close up was staggering. After all this excitement quiet beach lunch was needed and with twenty beaches to choose from, we took a ten-minute drive to the beach at Saint -Marc-sur-Mer. 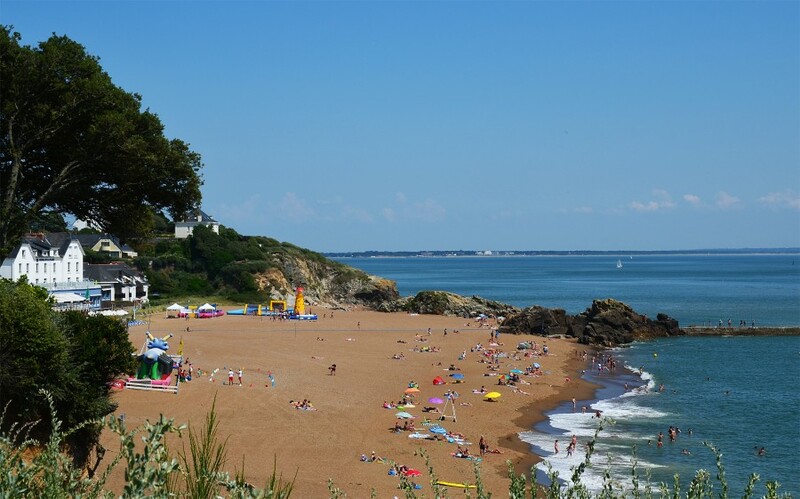 Locals call it Mr Hulot’s beach named after Jacques Tati’s comic character in the late 50s who inspired Mr Bean and Sellers’ Inspector Clouseau. 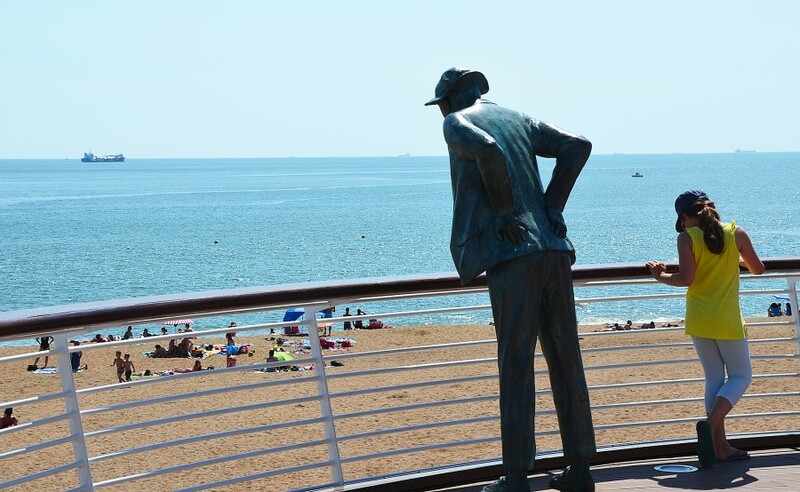 M. Hulot’s Holiday was filmed here and there is a statue of the great man overlooking the beach. We enjoyed a lunch formidable at Restaurant le France, so close to the sea it was almost within touching distance. Back at Le Château du Deffay the restaurant was gearing up for the French World Cup semi-final. As I cheered on the mighty les bleus (it seemed the right thing to do under the circumstances) I felt an acceptance as a token local. Sadly that wasn’t quite the case the following night when England played. The following morning, after devouring oven fresh pain au chocolat, we headed out for another boating experience but this time on the gentle waterways of the Grande Brière. 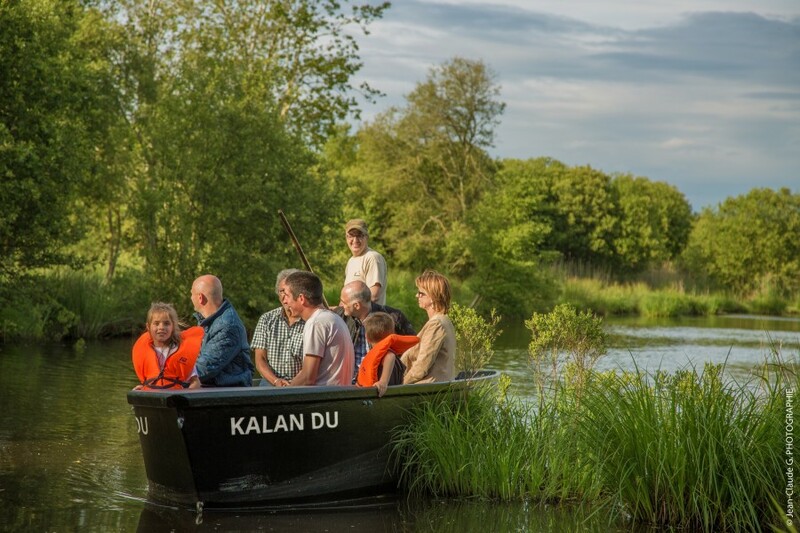 Alain Leveque, a man who has lived here all his life provides tours on along the waterways of the Brière in his custom-made chaland a traditional flat-bottomed boat. As he punted us along with just utter quiet and occasional birdsong for company he chatted about this extraordinary marshland. Many years ago it provided a livelihood from digging out peat and extracting the reed stalks that were used in the manicured thatched roofs of the beautiful cottages you see all over this region. Once metal hulled ships began being constructed in the1860s the farmers left to work at the shipyard and the Brière became the tranquil landscape it is today. La Baule’s 9k beachfront was probably the main ingredient in turning this quiet seaside commune into a summer magnet for the rich and famous of 19th-century Parisian high society. The casino, the grand villas and fancy restaurants made it a sought-after destination to rival Le Touquet or Cannes and Saint Tropez. Yet, it is still arguably unknown outside of France. 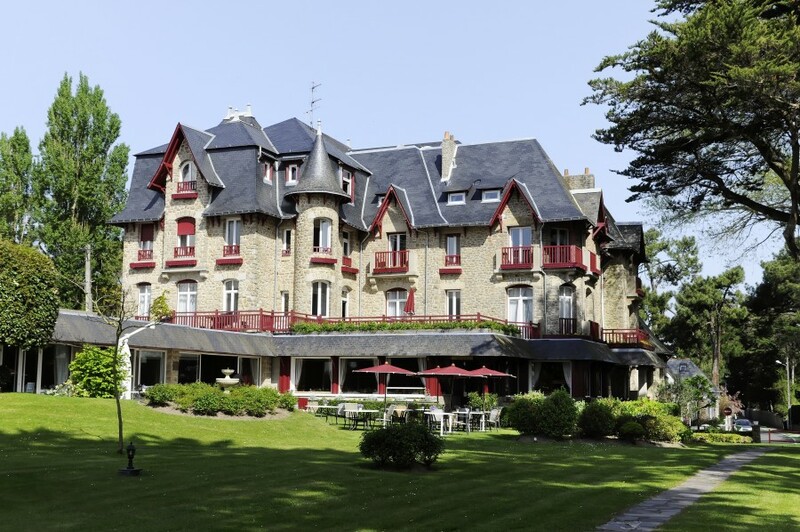 Today, La Baule remains a high-end resort with the luxury Lucien Barrière Group owning substantial properties here. There is a timeless elegance about the place and there surely can’t be a better example of this than an indulgent lunch in the gardens of the beautiful Castel Marie Louise hotel just a stone’s throw from that famous beach. The hotel together with its two sister properties, L’Hermitage and The Royale form a luxury triumvirate that personifies La Baule. 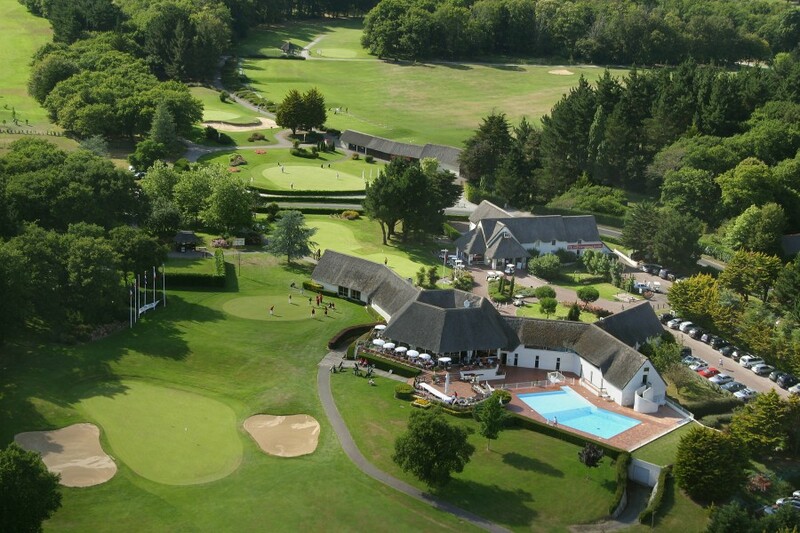 Barrière also operates Barrière International La Baule Golf Club a 540-acre forested estate just 15 minutes outside of town. The 18 hole red and blue championship courses offer a stiff golfing test whilst the nine-hole green course provides an enjoyable romp for the higher handicap player. Just for the record, I found the tall rough and the abundance of lakes on the blue course a real challenge. You have been warned. 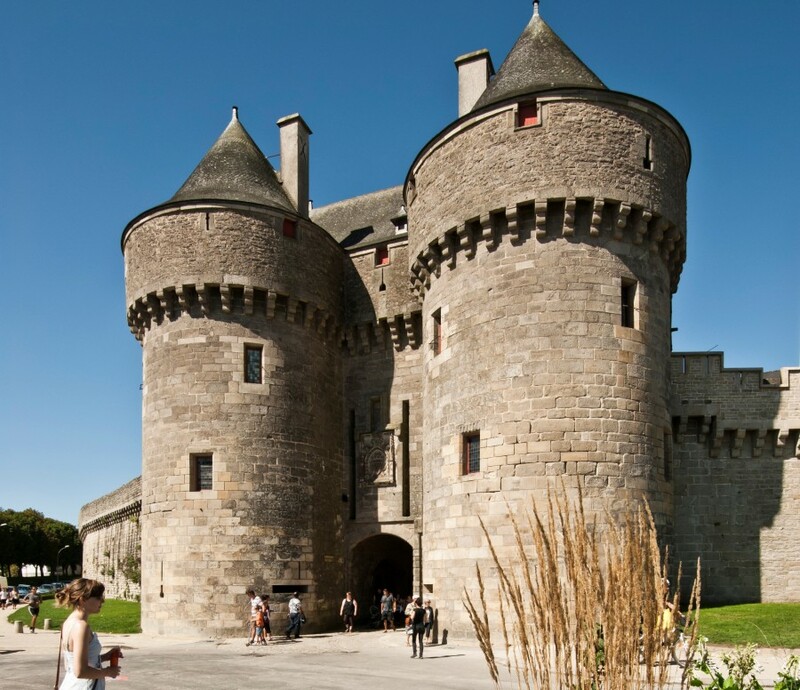 The fortified town of Guérande is a reminder of how important salt was in the middle ages. Overlooking salt marshes this small walled town is worth a wander around for its medieval atmosphere and art and craft shops tucked away in its narrow cobbled streets. Guérande salt is available to buy of course, but take a walk along the ramparts and take in the views. Back at Le Château du Deffay we battened down the hatches of the motorhome and bid our neighbours adieu as we rolled out for an overnight stop near La Rochelle before heading back to St. Malo for our crossing home. After five days on the road, I reckon I could cast myself as an almost seasoned camper. Our Bailey motorhome proved to be a real multi-tasker. A constant companion, a reliable friend, a cosy home and a proper road warrior. I swear I had a tear in my eye when we parted company. 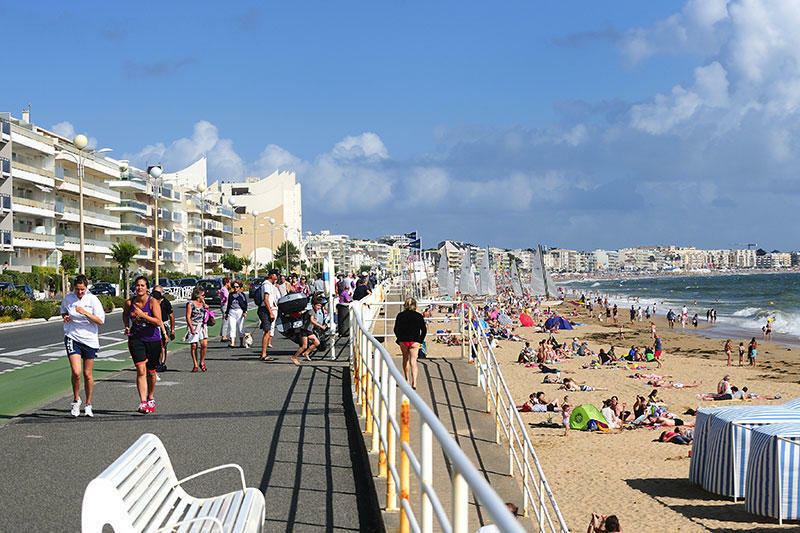 For more information on following in Andy’s footsteps visit Saint-Nazaire and La Baule Tourism. 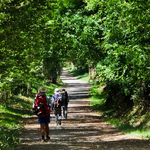 For more information on touring Brittany visit Brittany Tourism. 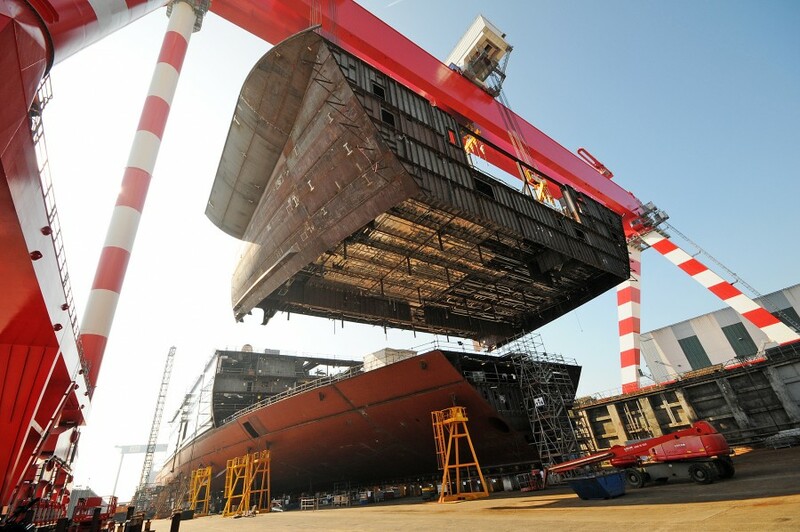 Chantiers de l’Atlantique shipyard tour Tours from €18 per person including coach transfer and dry dock walk. Combination tickets are also available. Bailey of Bristol has been making leisure vehicles in Bristol for over 70 years. 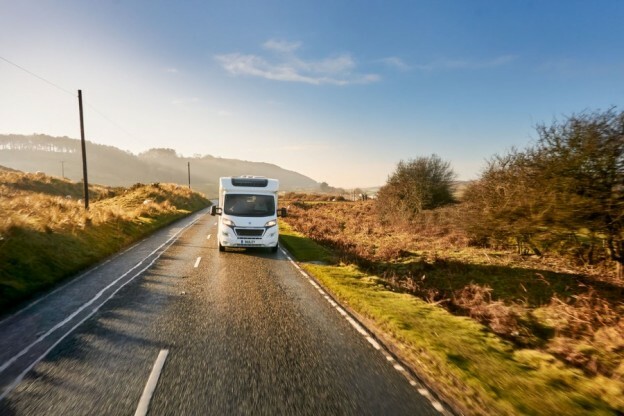 The first Bailey Motorhome came to market in 2011, and have built a loyal following commanding nearly a quarter of the market. All Bailey leisure vehicles are built using the patented Alu-Tech construction system making them strong, lightweight and durable. The Bailey Advance 74-2 price: £46,000. Brittany Ferries operates the longer routes from Portsmouth, Poole and Plymouth direct to Brittany and Normandy. Travel overnight by luxury cruise-ferry in the comfort of your own cabin with en-suite facilities. 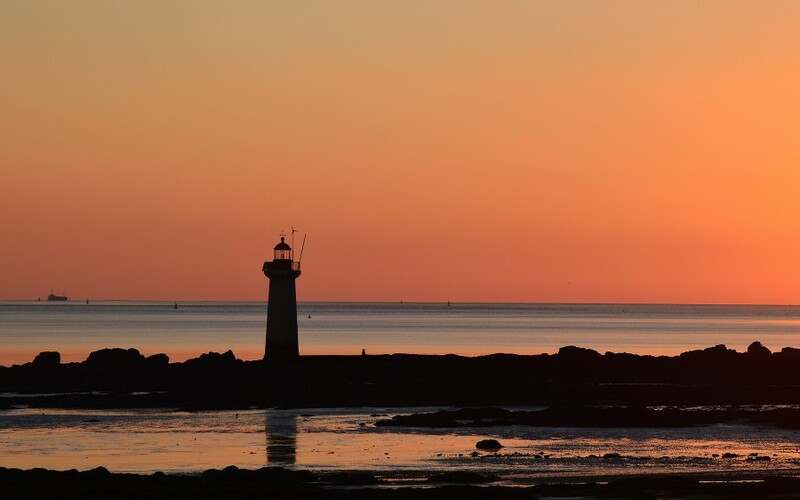 Portsmouth to St Malo return fares start from £336 for a motorhome plus two, including an en-suite cabin on the outward overnight sailing. Book online at Brittany Ferries or call 0330 159 7000. 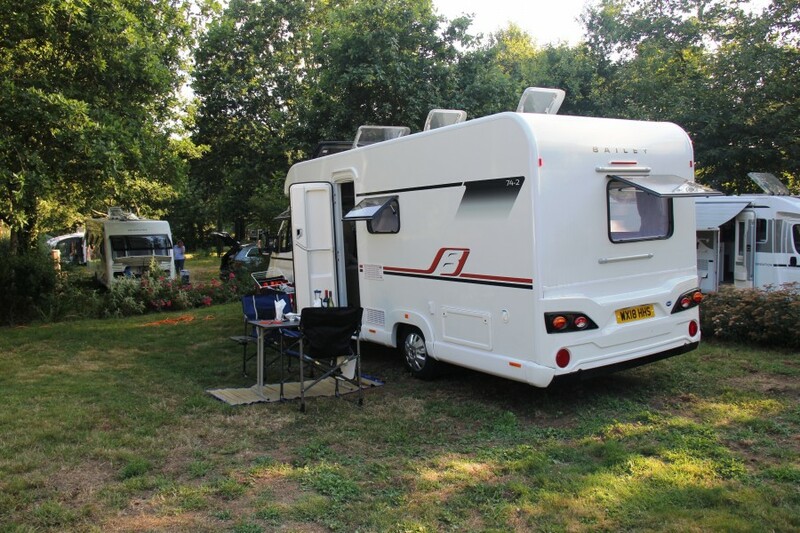 Champions of the great outdoors, the Caravan and Motorhome Club represent the interests of over one million caravanners, motorhomers and trailer tent owners across the UK. Founded in 1907, the Caravan and Motorhome Club has 111 years’ experience and prides itself on offering great value and high-quality sites for caravanners and motorhomers. Caravan and Motorhome Club membership is just £51 per year and provides members with access to over 200 Club sites and 2,500 privately owned places to stay in the UK. UK Club sites can be booked a year ahead, all year round. 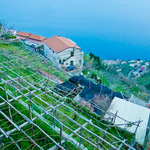 The Club also offers a choice of over 300 sites across Europe including France, Spain and Germany amongst other destinations. All members can take advantage of expert advice, overseas travel services, cover and insurance and exclusive member offers and discounts. There is no membership requirement for campers who want to pitch up at over 40 Caravan and Motorhome Club sites. The CAMC can book all your travel and campsites and arrange Red Pennant travel insurance. A fully comprehensive, detailed excellent revue. Having sampled the delights of La Baule as a child with my parents, I,m very tempted to return now. Thanks for your comments Trevor. 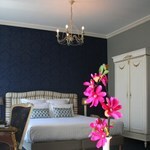 I feel sure La Baule will welcome you back with open arms. Keep an eye out for those delightful thatched cottages that are all over the region.